Exposure to particulate matter air pollution has been associated with increased incidence of cardiovascular disease [1–3], including arrhythmias , myocardial infarction  and heart failure . Prenatal and early-life exposure to PM2.5 and PM10 is associated with deleterious effects, such as decreased placental mitochondrial DNA , decreased fetal growth , reduced birth weight  and increased newborn systolic blood pressure . Currently, understanding the effects of in utero exposure to DE on newborn and early life health has become a public health concern, as multiple studies link maternal exposure to air pollution with increased risk of congenital heart defects [10, 11], childhood cancers such as retinoblastoma and acute lymphoblastic leukemia , and increased incidence of maternal gestational type 2 diabetes mellitus , which can in turn increase infant risk of metabolic and cardiac disorders . Our lab has shown that in utero exposure to DE in mice predisposes the male offspring to heart failure after transverse aortic constriction (TAC) surgery . There is growing evidence of alterations in epigenetic control due to PM2.5 exposure. PM2.5 and PM10 exposure have been correlated with significantly decreased global DNA methylation in blood cells as indicated by LINE1 and Alu methylation [16–18], as well as changes in targeted loci such as decreased methylation in the iNOS promoter  and increased methylation at the p16 promoter . Diesel exhaust exposure specifically has also been shown to cause dysregulation of epigenetic signatures. Human bronchial epithelial cells exposed to diesel exhaust particulates via culture showed dysregulation of > 60% of microRNAs , and BALB/c mice exposed to diesel exhaust and given allergenic stimuli showed hypermethylation of the interferon-gamma promoter and hypomethylation of interleukin-4 in T-cells . We have also previously shown hypomethylation in exon 1 of GM6307 in neonatal cardiomyocytes (NCMs) resulting from in utero exposure to DE, which correlates with dysregulation of the contiguous miR133a-2 gene . We have shown that the transcriptional profile of NCMs is significantly altered as a result of in utero exposure to DE, in large part affecting genes associated with metabolic pathways (Tables 1, 2). Metabolic dysregulation is a hallmark feature of heart failure , with decreased fatty acid oxidation and increased glycolysis playing an important role in late-stage heart failure [31, 32]. While it is unclear how these findings might affect adult susceptibility to heart failure, multiple studies have discovered a link between exposure to air pollution and metabolic dysregulation [33–35]. Combined with our prior findings of increased expression of Ptprf , a transcriptional change associated with decreased sensitivity to insulin signaling , this suggests a potential role for metabolic dysregulation as a causal link between in utero DE exposure and adult susceptibility to heart failure. Additionally, we have shown that respiratory capabilities of NCMs from in utero DE exposed neonates are hindered at both baseline and maximal respiration (Fig. 2b and c). 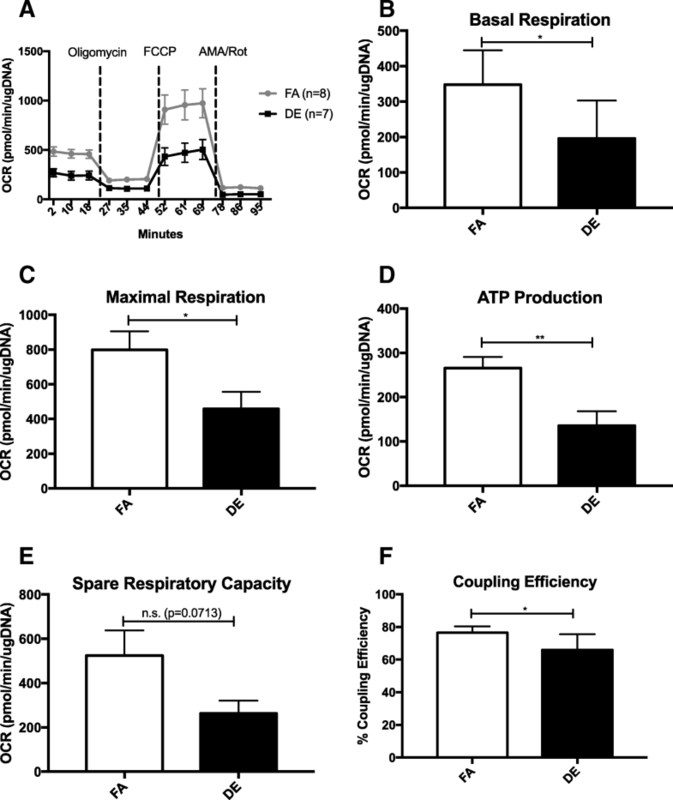 NCMs from in utero DE exposed neonates also demonstrate decreased ATP production and coupling efficiency (Fig. 2d and f), indicative of higher energy loss and ROS production . Given the known role of impaired metabolic activity on heart failure , these findings suggest that metabolic dysregulation during development may increase the susceptibility to heart failure at adulthood in our model. However, the persistence of the observed transcriptional alterations and the observed metabolic defects through adulthood and the causal relationships with the development of heart failure remain to be elucidated. Overall, our findings of transcriptional dysregulation in NCMs as a result of in utero DE exposure will aid in guiding the experimental focus for determining modifications in cardiac function caused by exposure. It is unclear whether this change in DNA methylation is occurring through a directed or undirected pathway. Exposure to PM2.5 has been shown to have an associated increase in oxidative stress [47–49]. Passive removal of DNA methylation can occur due to oxidative damage from ROS by damaging the DNA to the extent that DNA methlyltransferases (DNMTs) are unable to bind to the lesion area, thereby averting the maintenance of methylation in daughter cells [50, 51]. If this process is occurring early in development during the repatterning of methylation, these changes would be extremely heritable, and likely occurring in multiple cell and organ types . It is also possible that cellular damage due to oxidative stress prevents DNA methylation through sequestration of glutathione . Targeted changes in DNA methylation in response to air pollution have been described previously. 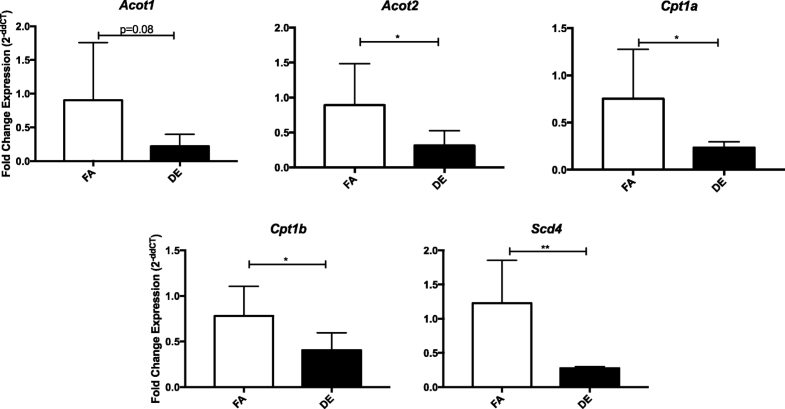 Hypermethylation of the p16 promoter in alveolar epithelial cells of mice exposed to PM2.5 in conjunction with increased DNMT1 expression has been reported  and decreased methylation on the first exon of Gm6307, which drives miR133a-2 expression, has also been reported in association with in utero DE exposure . Our studies of transcriptional dysregulation in NCMs did not identify any DNA methyltransferase or TET family enzyme genes as being differentially expressed, though this does not preclude the possibility of altered expression earlier in development leading to decreased methylation that was maintained until birth.